Earlier this year I not only was spending not only a bit of time in the pool, but for the first time in my life something clicked: I actually felt fast. My swim form, usually atrocious at worst and erratic at best, had smoothened out and felt long and efficient with decent propulsion. 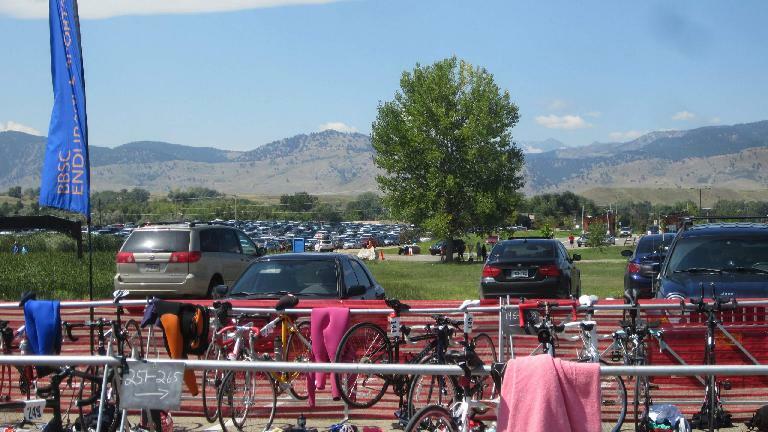 In fact, I felt fast enough that I decided to sign up for a triathlon, my first one since Ironman Arizona eight years ago. Eight! 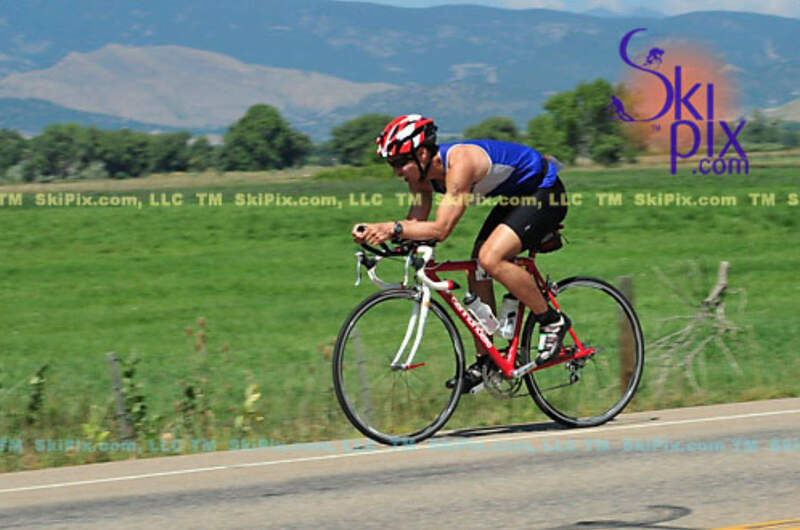 Except this time instead of doing the longest of distances, I signed up for the shortest: the sprint, requiring a 750-meter swim, 17.3-mile bike, and 5-kilometer run. Unfortunately, ever since the glimmer of speed in the water earlier this year, I got busy and lost both time and motivation to hit the pool. Or, worse, to hit the lake. And thus my return to open water racing turned out to be an utmost disaster. The water was warm at reported 74 degrees. Warm enough that I decided not to wear a wetsuit, figuring whatever time I lost I’d make up in the transition by not having to take it off. Plus I hadn’t practiced swimming in my wetsuit beforehand, and I know from a decade ago the wetsuit can feel a little restrictive and uncomfortable at first. Swimming wetsuit-less was probably not a big mistake, but not jumping in the water and, say, testing out eight-year-old goggles ahead of the race certainly was. When it was time to go I quickly found that I could not see a thing out of the leaking goggles and became gravely disoriented. Enough that I had to stop several times to gain my bearings and even resort to floating on my back in order to drain opaque water out of the lenses. Eventually, the goggles were working acceptably, but trying to sight and navigate was still difficult—particularly because the only things to aim for were directly in front, necessitating picking up my head and dropping my feet and breaking up any resemblance of rhythm every few strokes. I managed aim towards and stick close to the first two buoys, but when it came time to turn back to the beach, I went way wide as evidenced by the wave after me that was passing me way to the left. I was relieved to be back on terra firma after completing the swim, but as I ran towards the transition zone I couldn’t help but shake my head: 28 minutes for a half-mile. Ridiculous. Worst swim ever. The rest of the triathlon went better after that despite fumbling putting on a singlet in the transition area, as it was time for my preferred activity: cycling. A few weeks ago I re-mounted aerobars on my Cannondale 3.0, as she’d be the one getting triathlon duties in my stable of bicycles. 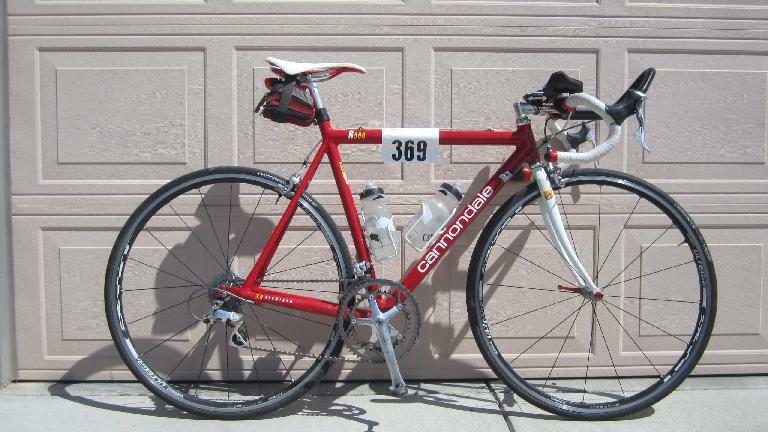 (I don’t have aerobars that would fit the Super Bike.) I took them off years ago in the interest of saving 605 grams, but after practicing with them, let me tell you aerobars make a significant difference in both speed and comfort. Even though the race is over I will leave them mounted—particularly because I think they were helpful in putting in a decent performance during the bike leg. How decent? Despite feeling foggy out of the water, I passed about 100 others on the bike, whereas only 2 passed me. Actually, I passed both of them back, so the net passed-by count was in fact zero. Despite the course being mildly hilly with several tight right-hand turns, my average speed was 22.1 mph. Not Tour-de-France-beating by any measure, but I’ll take it especially since I was only going at 90% in order to save something for the run. During the run, I also was mostly passing people, even if my final 5k time was somewhat disappointing: 23:30. But the run was two-thirds on sandy gravel, and a 7:33/mile pace is honestly what I would have expected after biking hard for 47 minutes. In any case, it was heartwarming to run here at the Boulder Reservoir: this was, after all, the site of my last 100-mile run, something I look back at fondly, even if I felt absolutely horrific by the end of that adventure. Today was not a bad day. And there was still a little bit of time to return to Fort Collins and bike a little more, this time for the Tour de Fat.